Never Wears Out. Never Expires. What is it? 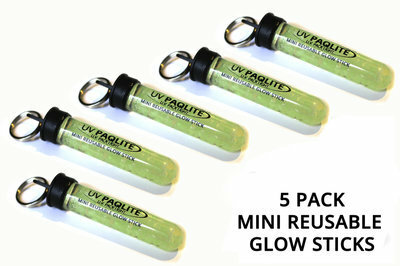 Mini Reusable Glow Sticks (2 1/4" x 3/8") glow as identifiers in the darkness all night long, recharge from any light source, and are reusable over and over again forever. They never wear out or degrade over the years. Attaches to easily to things you want to find in the dark like key, zipper pulls, etc. Suggested Uses: Attach to items you need to find in the dark such as: kids, keys, flashlights, backpacks, gear, fire starters, etc. I use these on all keys and pack zippers they are small but mighty and put out lots of light.